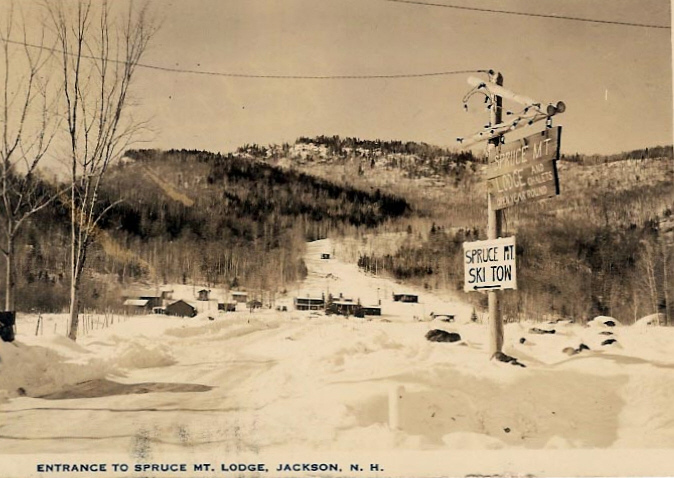 Spruce Mountain was a small ski area located in the famous ski-town of Jackson, NH. In fact, Spruce was one of at least 8 areas that operated in that town at one point in the past. I received this brochure from Spruce Mountain from the 1938-1939 season, just before the War. The brochure from below was sent to one Daniel Rochford, of New York City, who had requested the info in early January, 1939. 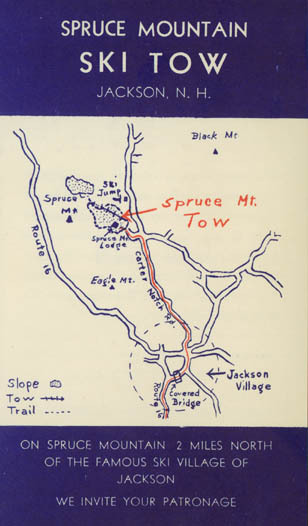 Here are the details from inside the booklet, which best sums up Spruce Mtn. The Spruce Mt. Tow is made by Underwood and one (sic) of the finest Tows in the Eastern Slope Region. (Underwood made portable, typically 1000 foot long tows). The open slope is 1500 feet long, 325 foot vertical drop. 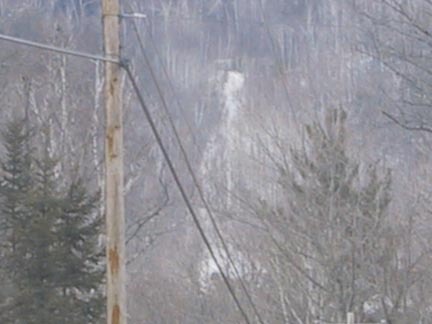 Tow and slope are floodlighted for evening skiing and connect with the 0.75 mile Spruce Mt. Trail and large open slope at top of trail 1200 feet long, 300 foot drop; adjoining the White Mountain National Forest. There are practice slopes for beginners. To accommodate our ski patrons, we offer a soup kitchen-a well equipped ski shop and a waxing and game room. We also offer instructions in skiing and jumping. As we are in the Snow Belt, snow conditions are most always perfect here on Spruce Mt. For those who desire accommodations by the day or week, Spruce Mt. 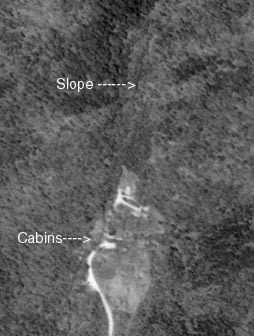 Lodge and Chalets is adjacent to the Tow and located on the lower slopes of Spruce Mt. A Main Lodge, with huge open fireplaces, lounging rooms and dining room is surrounded by Chalets and accommodating two to eight persons. The needs of skiers are given special attention and the Lodge provides an abundance of wholesome, home cooked foods. The Chalets are warm and comfortable. Come and mingle with as find a group of skiers as you can find anywhere and enjoy our ideal slopes with Tow right at the door of your chalet. We are situated about 12 miles from the Tuckerman Ravine Trail. We meet all trains on request--at Intervale or Glenn-Jackson Stations. The area continued to operate in the 1940's, and was listed on a 1949 Eastern Ski Map as "A complete ski resort. Ski tow. Floodlighted slopes. Ski classes. Folder on request." Here's a picture of the area likely from the 1940's. Courtesy Laurie P.
The area closed briefly at some point in the 1950's, then reopened for skiing from about 1962-1971. At this point, a 1000' long Poma lift was installed. Berneen Bratt sent us the following information on this period, when her family owned and operated the area. My parents, Bernard and Guila Mallard, bought Spruce Mt. Lodge from Lars in 1958, and eventually cleared the gentle slope in back of the main lodge and put in a 1000-foot poma lift! It was free for customers of the Lodge, and open to the public for a fee. I am not sure of the year, but possibly from 1962 through 1971, the year my parents sold SML. It was a small, family operation. To pack the slope after a snowfall, my father rode his skimobile up and down, and I skiied it over and over. I have a winter brochure for that time period, and a summer postcard showing the cleared slope behind the lodge. As your current photos show, the slope is quite overgrown. And, sadly, the remnants of the once-thriving resort (our closest competitor was Eagle Mt. House--still in operation nearby on Carter Notch Road) are personally difficult to observe--fallen-down cabins, felled-spruce trees, filled-in cement swimming pool, dilapidated horse barn (my sister started her current business there! ), overgrown clay tennis court. I grew up there and I remember it in its heyday!" Today, the area has grown in substantially, and many of the structures on the property are in disrepair. Here's an aerial shot of the area. The slope has almost completely grown in, but is still distinguishable (if you use your imagination). Betsy McDonough and Laurie P spotted this area in Mar, 2002, and took this picture from a distance. Notice how grown in it is!